Amblyopia, also known as lazy eye is a vision disorder that is characterized by indistict and or poor vision in an eye that is actually physically normal.”Lazy Eye” is caused by a limitation in the transmission of the visual world through the optic nerve to the brain for a sustained period of childhood thus resulting in diminished vision. Amblyopia normally only affects one eye, but it is also possible to be amblyopic in both eyes if they are similarly deprived of clear retinal images. When this condition, the chances of successful treatment is much improved.While the term “lazy eye” is used to refer to amblyopia, the term is wrong because there is actually no “laziness” of either the eye. “Lazy brain” is a more accurate term to describe amblyopia. The term “lazy eye” is totally untrue.Also incorrectly called lazy eye, strabismus is a condition in which the eyes don’t point straight ahead. Strabismus usually results in normal vision in the preferred sighting (or “fellow”) eye, but may cause abnormal vision in the deviating eye due to the discrepancy between the images projecting to the brain from the two eyes. Adult-onset strabismus usually causes double vision (diplopia), since the two eyes are not fixated on the same object. Children’s brains, however, are more neuroplastic, and therefore can more easily adapt by suppressing images from one of the eyes, eliminating the double vision. This plastic response of the brain, however, interrupts the brain’s normal development, resulting in the amblyopia. When one eye is stronger, or better corrected than the other, the information from that eye is ignored by the brain. Over time this neglected eye develops poor or blurry vision. In the picture above, the left eye is not as strong as the right eye. 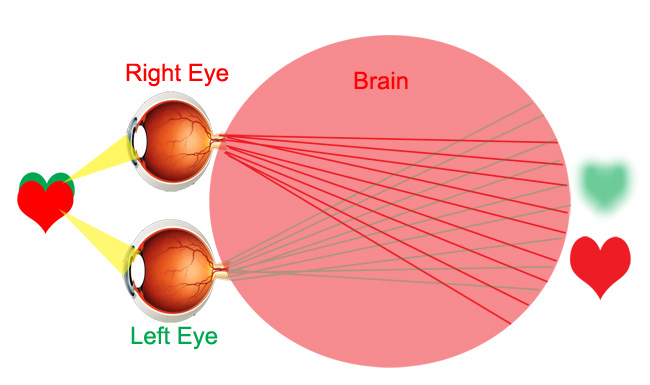 Over time the image in the right eye created in the brain is clear and sharp, while the image from the left eye is blurry. Form-deprivation amblyopia (Amblyopia ex anopsia) results when the ocular media become opaque, such as is the case with cataracts or corneal scarring from forcepts injuries during birth. These opacities prevent adequate visual input from reaching the eye, and therefore disrupt development. If not treated in a timely fashion, amblyopia may persist even after the cause of the opacity is removed. Sometimes, drooping of the eyelid(ptosis) or some other problem causes the upper eyelid to physically occlude a child’s vision, which may cause amblyopia quickly. Treatment of individuals age 9 through adult is possible through applied perceptual learning.Form deprivation amblyopia is treated by removing the opacity as soon as possible followed by patching or penalizing the good eye to encourage use of the amblyopic eye.